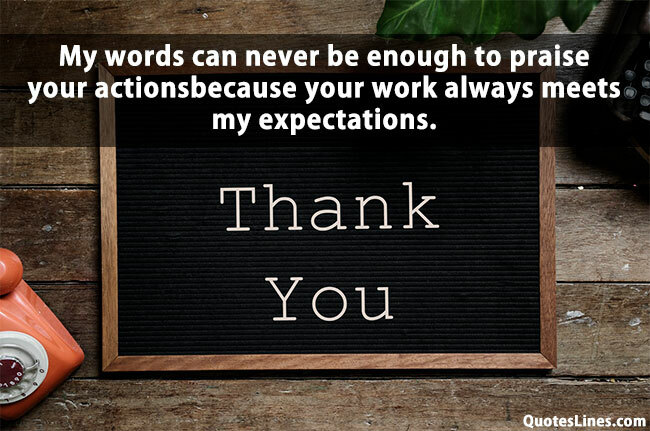 Thank You Quotes for Employees : Thanking your employees will work as like a magic to increase the total productivity of your company or institution. Also, appreciating office staff and workers always help to ignite the willingness of workers and exhale their dedication to work. 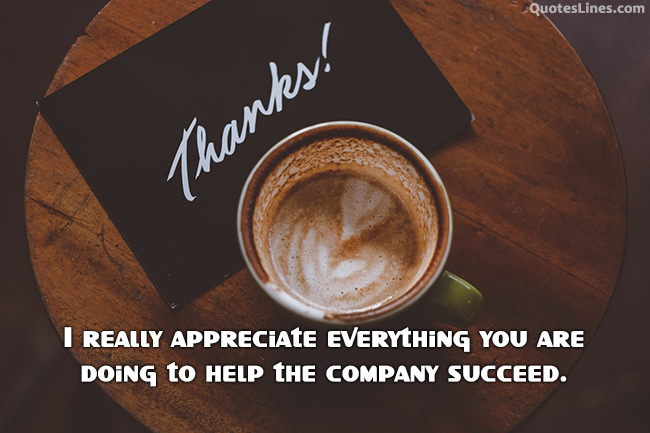 There are some amazing benefits of employee appreciation quotes like as boosting confidence, developing the moral attitude and especially inspiring employees. That was some common purpose of thank you quotes for employees but sometimes they deserve it for their hard work, best performance or even for a job well done. 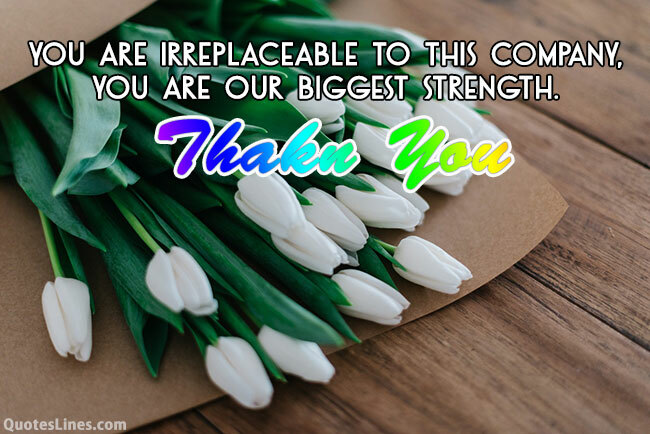 Here are some thank you quotes for employees what you can use to appreciate your employee’s hard work, to congratulate for success and job well done wither to show your gratitude for their working dedication. I really appreciate everything you are doing to help the company succeed. I would like to thank you for being there for me always. You are the best office-Staf I have ever worked with. Your positive attitude cheers up the atmosphere in our office environment. You simply have lots of ideas and talents. Thank you. I am looking forward to working more projects with you. It was so nice of you to help me out. I really appreciate all that you’ve done and hoped that this card will help me to express all my gratitude. Thank you! You have watched over me at work just like parents watch over kids until they can walk by themselves. Thank you for all your help. I don’t mind taking risks because I know that Office Staff like you will always be there to catch me if I fall. Thanks for your support. Dear mate, your help has really made my body and mind both feel healthy. Thanks for your kind assistance. A perfect employee is the one who motivates his boss as much as his boss motivates him. Thanks for being an inspiration and motivation to me. You are our company’s perfect catch and an ideal employee whose performance no one else can match. Thank you. You are irreplaceable to this company, you are our biggest strength. Thanks. Mere words can never be enough to admire your actions because your work always meets our expectations. Thank you. Your passion is a quality that cannot be learned and an ability which cannot be taught. Thank you for being a part of this organization. 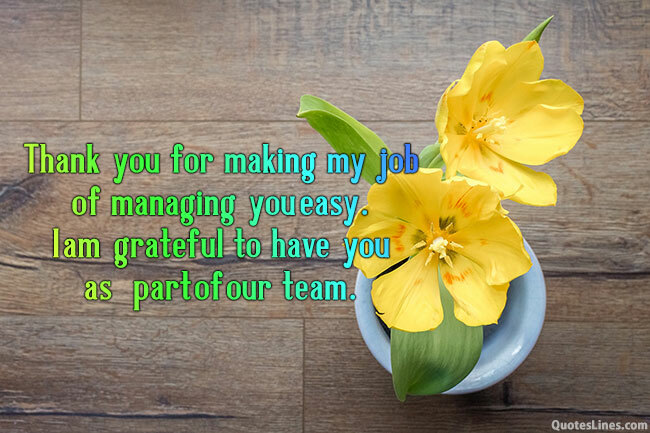 Thank you for making my job of managing you easy. I am grateful to have you as part of our team. Those employees who are forceful in terms of “assertiveness” especially appreciate the prompt response from you: ‘Thank you for keeping the momentum going!’or’I appreciate your decisive action. Thank you for your hard work and honesty. We really appreciate your style of work. Well done. Thanks for backing up the credentials in your resume with hard work, perseverance, and loyalty to the company. Your hard work and effort have paid off! A success well deserved, an occasion worth celebrating! Congratulations! It’s great working with you. You are one of the reasons for our success. Thank you! I see how hard you worked on this recent task. I appreciate all you are doing for the company. For that, you deserve a break. The destiny of hard work is always the success. 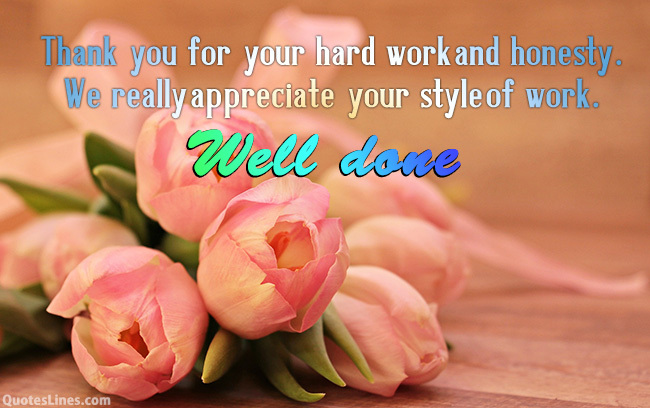 You have done hard work and got succeed. Congratulations on your huge and marvelous success. Your hard work and dedication show in the quality of your output. I really appreciate that. Thank you. Not a single effort of yours will go in vain. You will be rewarded for your pain. Your hard work will bring you a lot of gains. Well done. 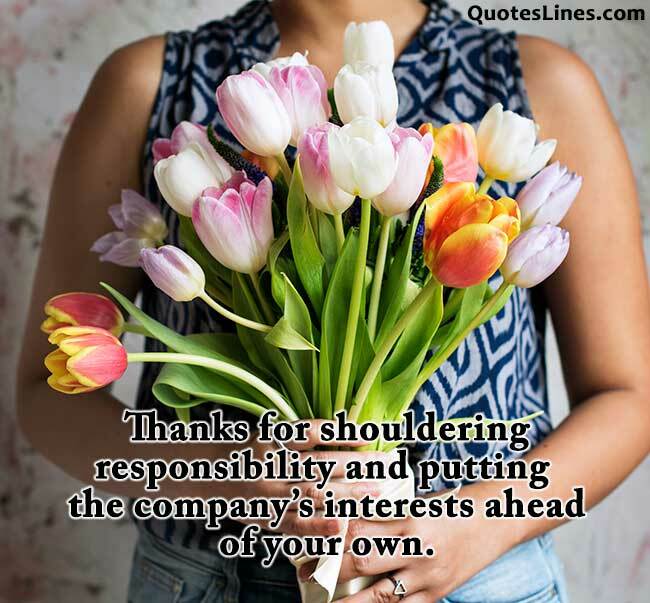 Thanks for shouldering responsibility and putting the company’s interests ahead of your own. Thanks for always being on my side. You are not only my workmate; you are my best friend and my mentor. My heart just keeps thanking you for everything that I have learned from you. Thank you for the fantastic job you have been doing for our company lately. 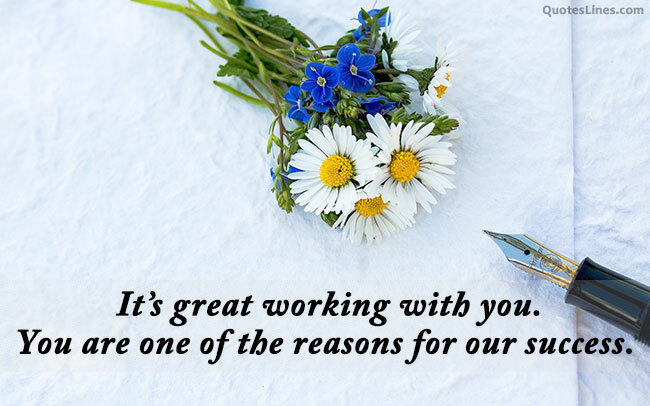 Your hard work and dedication have really helped us out during a difficult time in our company. I am very appreciative of your support and your thoughtful gift. They really mean so much to me. Thank you for recognizing and rewarding my contributions at work. Not everyone is a creative thinker… but you are. I appreciate your critical thinking around this project. I cannot express how blessed I am to have you as my colleagues at the workplace. Thank you for your thoughtfulness! To have someone like you. 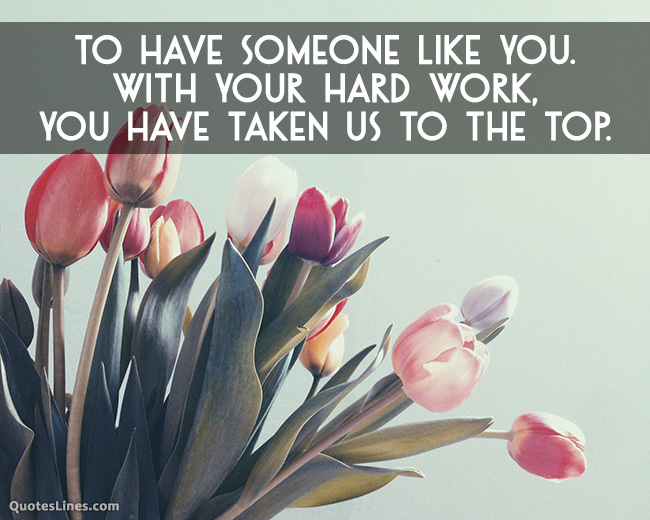 With your hard work, you have taken us to the top. Thank you! Your professionalism embodies the company philosophy and your hard work is a prime example of how employees can further their careers in our organization. Thank you. Really, you need to admire your employees, office staff, workers or subordinates work now and then. If you are a boss or owner of an organization than your few words can make them more attentive in work and make them feel an important part of your institution. Feel free to use these quotes to use in a card, employee appreciation notes or however you want to send these words of inspiration.